Steve Anderson on Littlemak. Hart Photography. 2018 Lucas Oil NCHA Super Stakes � April 2, 2018 � Fort Worth, Tex. 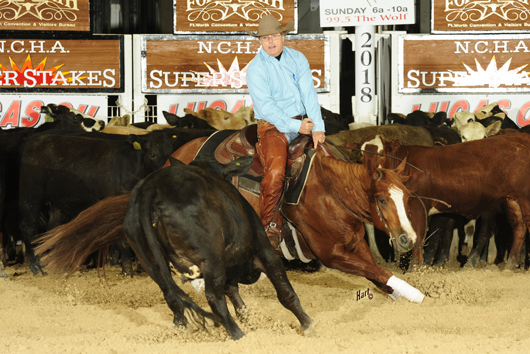 Steve Anderson, Victoria, Tex., scored 219 points to top the first of two days of NCHA Super Stakes Classic Non-Pro first go-round competition. Austin Blake, Canyon, Tex., and Lindy Ashlock, Abilene, Tex., each earned 217 points, the second-highest score, while Langston Patillo, St. Elmo, Ill., and Carly Chiarelli, Poolville, Tex., tied with 216.5 points. NCHA Non-Pro Hall of Fame inductee Steve Anderson, the earner of $732,177, was a 2017 NCHA Super Stakes Classic 5/6 Non-Pro Semi-Finalist riding Cats N Reys, and showed Little Jo Cat as a Non-Pro finalist (7th) and Non-Pro Gelding champion in the 2017 NCHA Futurity. He also showed Smooth N Cattacular as reserve champion of the 2012 NCHA Derby Non-Pro. Six-year-old Littlemak has earned $134,241 under Anderson and trainer Jon Burgess. Burgess showed the Starlights Gypsy gelding as Limited Open champion of the 2016 NCHA Super Stakes and the 2016 NCHA Derby, and most recently placed fourth with him in the 2018 Abilene Spectacular 5/6 Open. Burgess also showed Littlemak�s full brother, PKR Big Mac LTE $183,289, out of Justa Swinging Gal, by Justa Swinging Peppy. Austin Blake is a two-time NCHA Futurity Non-Pro champion, as well as a two-time NCHA Super Stakes Non-Pro finalist, and a Super Stakes Non-Pro Novice champion. He won the 2016 NCHA Futurity Non-Pro championship with Lookin Sneaky�s full sister, Stuffin My Pockets LTE $72,365, and the 2010 NCHA Futurity Non-Pro championship on One Rockin Pepto LTE $144,665. In 2009, Blake placed eighth in the NCHA Super Stakes Non-Pro and also won the Novice Non-Pro division on Smartys Gonna Pass, the dam of Lookin Sneaky and Stuffin My Pockets; in 2012 he placed seventh in the NCHA Super Stakes Non-Pro riding Sly Lil Cat. Five-year-old Lookin Sneaky, sired by Dual Smart Rey and bred by Blake, carried Blake to place third in the 2016 NCHA Futurity Non-Pro Limited, as well as the finals of three major 2017 limited age events, and as a Non-Pro semi-finalist in the 2017 NCHA Super Stakes and NCHA Derby. Lindy Ashlock, an NCHA Non-Pro Hall of Fame member and the earner of $1,476,286, won the 2017 NCHA Super Stakes Non-Pro with In Reyverse LTE $89,108 and was reserve champion of the 2009 NCHA Super Stakes Non-Pro riding Rey Nounce LTE $116,134. Five-year-old Catin Safari, by Cats Moonshine, was bred by Ashlock�s parents, Tom and Jan Merryman, out of Safari Belle, who is the dam of Smart Sweetnlow LTE $290,975, by Smart Sugar Badger. Ashlock showed Smart Sweetnlow to place sixth in the 2007 NCHA Futurity Non-Pro and went on to win the $150,000 winner�s check with her in the 2008 MillionHeir Classic 4-Year-Old Non-Pro. Ashlock and Catin Safari earned $62,536 in 2017, including earnings as Non-Pro champion of the Brazos Bash and Non-Pro reserve championships of the Breeders Invitational and the El Rancho Futurity.